With Chanukah starting early this year (the 1st candle is December 2nd! ), my kids are already looking forward to the candles, the latkes, the sufganiyot, and – let’s face it – the presents. We don’t do extravagant gifts, but my kids usually have *something* to open most nights. This year, however, my husband and I have decided to step away from things – particularly toys – and move more toward “experiences”. We are very fortunate to be able to give our kids everything that they need – and many things that they want. Piling on eight more things feels excessive and unnecessary, especially during a holiday that isn’t really even supposed to be about gift-giving. The expectation of a tangible gift to open every night can sometimes lead to it not feeling very special (another night, another present) – which can sometimes lead to a lack of appreciation or gratefulness. Thank G-d, we have great kids, but the “What am I getting tonight?” question doesn’t strike me as the kind of value we want to attach to Chanukah. All of that said, Chanukah is still a fun opportunity to treat our children and ourselves, and we don’t want to make the holiday completely austere. Therefore, we have decided to focus more on experiences and gifts that the children and/or our family can enjoy together. 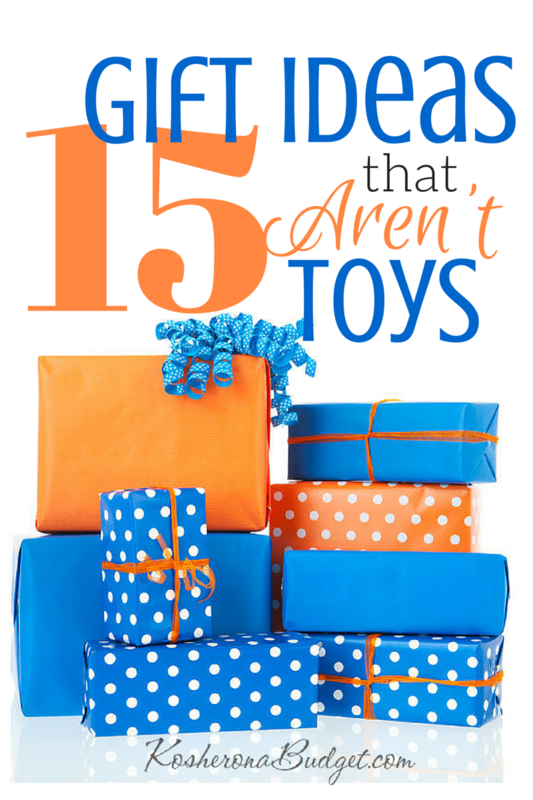 If you’d like to move more in that direction as well, here is a list of 15 Gift Ideas That Aren’t Toys. We aren’t doing all of these this year, but we did consider them – and might well do them in them future. 1. Tickets to an event. Whether to the movies, the circus or the symphony, tickets to an event are a fun opportunity to spend one-on-one time with mom or dad. I remember fondly getting dressed up to go to the ballet with my mom. It’s a great opportunity for your child to feel grown-up and special. 2. Classes or Lessons – Last year, my children’s grandparents got them a year’s worth of music lessons (we have a drum, piano and guitar player now!). It was a very generous gift, and one that my family will benefit from for years to come. 3. Memberships – Do your kids love the local zoo, aquarium, art museum, science center or children’s museum? A year-long membership is a gift that keeps on giving. Even better, most memberships have reciprocity with similar attractions in other cities. Our science museum membership has gotten us into five other science centers this year alone. It’s a great way to help keep costs down when traveling. Memberships also make great gifts from grandparents. 4. Dress-Up Clothing – Depending on the age and personality of your children, dress-up clothes can be the best gift. Instead of buying costly princess costumes from Disney, you can hit up your local thrift store. My boys are sadly past this stage, but for my daughter, I’ve found formal dresses, accessories (I once found an awesome jeweled tiara at my Saver’s), shoes and handbags. 5. Magazine Subscriptions – My boys are sports fanatics, so a subscription to Sports Illustrated or Sports Illustrated Kids is perfect. Not only do they receive mail every week or month, but they get to learn more (by reading!) about a subject they adore. If you order a subscription now, the first issue won’t get delivered for another 8-10 weeks. I recommend buying one copy to wrap up – with a note that a year’s worth are coming soon! 6. Savings Account – One year, I started savings accounts for each of my children with an $18 deposit in each one. They save one-third of their allowance, so each month they get to see their principal grow – and learn a little bit about the power of compounding interest as well. 7. Personalized Luggage – My kids are all at the age when sleep-overs are commonplace – and even weekends away from home (Shabbatonim, a special trip with their grandparents, etc). A duffle or suit case, monogrammed with their initials, makes packing for the trip even more fun! For older children, you can also get them a toiletry case with their initials. (My kids still throw a toothbrush in a Ziploc bag and think they’re good to go.) I buy our personalized luggage on sale at Lands’ End — of course with a coupon code, too. 8. Sleeping Bag – Again, with all the overnights that my kids enjoy, their own sleeping bag might be a nice idea. Be sure to get one that comes with a stuff sack. Otherwise, you will forever be fighting to get that thing rolled up and secured. Trust me. 11. Board games – Yes, board games could technically be considered toys, but board games (or even a deck of cards – my kids are SO into card games lately) are great for family fun. This year, we will have one Game Night for Chanukah – each child will open a small game (purchased for very little cost from Amazon) and we’ll play all three of them after candle lighting. 12. Books – I love books. Who doesn’t, right? I think a fun way to give the gift of books is a gift certificate for a used book store. Their money will go so much further! For pre-readers (or reluctant readers – I’ve had those, too), audiobooks are a great idea, too. You can get a FREE one-month trial to Audible.com right now, which comes with 2 free books. 13. New Pet – Caution: If you aren’t prepared for the expense and commitment of taking on a new pet, please, don’t give one to your child(ren)! On the other hand, if you are anyway ready to add a furry friend to your lives, Chanukah is a great time to do it. One year, we brought home our little Mac – short for Maccabee! – on the 3rd night of Chanukah. I’m fairly certain it was their best gift ever. If a new pet isn’t on the agenda, my kids have loved volunteering at the ASPCA or even visiting a pet store on “adoption day” to cuddle with some of their new puppies and kittens. 14. Homemade Gift Certificates –You can make up a booklet of free or low-cost gift certificates to be redeemed throughout the year by your child. From a “stay up late” pass to a “movie night with mom” pass, there are an infinite number of ideas you could use depending the age and interests of your child. To see more ideas and get a free template, go HERE. 15. Cooking Project – If your kids like to help in the kitchen, this is a great way to involve them in some cooking fun. Last year for Chanukah, I gave them a gift bag with some marshmallows, pretzels, Hershey kisses, frosting and sprinkles to make a version of these. Do you like to avoid giving lots of toys and other “things” at Chanukah? What are some of your favorite Gift Ideas that Aren’t Toys? This post reminded me why I love your site so much! Hanukkah Sameach!